First of all, thank you for writing in with so much support for Susan and Bermudez. Your ideas and good thoughts have made a huge difference, and Susan has expressed her continuing support of the effort. I’m not sure what to say about Susan’s resignation, still. To think that a librarian like Susan would give up her job after 33 years fighting for a book (which happens to be mine) is astonishing. I have no idea what the people on the committee are really like, day to day. All I know is that they REFUSE to tell me anything else, and that in and of itself is weird and shady . . . and yet all too familiar. To tell the entire truth, I feel kind of bad for the position they ended up in. There are quite a number of crackpot organizations out there (along with individual crackpots) who make a huge and concerted effort to take books away from you. Here’s one of the more prominent ones, which calls itself PABBIS (Parents Against Bad Books in Schools . . . you gotta love it). This little army of loonytunes wants to make sure that books like The Catcher in the Rye, One Hundred Years of Solitude, Beloved, Looking for Alaska, The Sisterhood of the Traveling Pants, Slaughterhouse Five, In Cold Blood, and The Secret Diary of Adrian Mole (along with many, many others) are immediately taken out of schools. PABBIS has not yet gotten to The Bermudez Triangle, but I am sure this is because they just haven’t noticed it. Maybe they are too busy building bonfires or trying to contact their Home Planet. But you know what? Just because crackpots are giving you a hard time doesn’t mean that you should rip the books from the shelves, lie your faces off, demote librarians, and curl into a fetal position when confronted. I’m sorry you have to deal with this, guys. I really am. I’m sorry that there are so many paranoid chowderheads out there who are afraid of ideas and books and knowledge and People From Outside. But to prevent making even more paranoid chowderheads who are afraid of books and ideas and knowledge and People From Outside . . . we need EDUCATION. We need you to protect the schools. Many Americans are getting narrower and weirder as the world is getting more and more interconnected and fabulous. That’s just not going to work. Fear of Everything is not a viable way of living*. Instead of banning books, we should be getting together and working toward new ways of saving the planet, collecting shiny things, and getting me a Vespa. Rant over. The bottom line next step is: I need to get the committee to just tell me what they recommended. Obviously, this is a secret, and I need to crack it. I was so busy writing about Bartlesville, that I didn’t get you all up to date on the many things I need to tell you. So let’s do that. WHERE ARE YOU THIS WEEK? AND WHERE IS FREE MONKEY? I will otherwise be at the home of Betty Vox, writing away. Betty has three dogs, so I will have lots of furry company. As for FREE MONKEY, he’s left for his World Tour! At least, the American leg. (International tour friends—your letters are coming soon.) His first stop is in Los Angeles to visit YA superblogger Little Willow. As soon as I have a report from him, it will be posted here! YOU SAID YOU HAD NEWS. WHAT IS THIS NEWS YOU SAID YOU WERE GOING TO TELL US? There are actually two things. The first is about the Extremely New Book That Is Not Girl At Sea . . . in other words, the one I am writing. There have been many developments on this front. First, it officially has a title. It is called Suite Scarlett (the original title was Empire Suite), and it will be coming out in May, ’08. I am about to start a major revision on it. The cover was shot the other day. I had unprecedented input into the process this time, and guess what? THERE WILL BE NO HEADLESS GIRL. I’ve seen the sketches, the location, and the model. The location was carefully chosen to reflect the setting of the book, which is an Art Deco hotel in New York. This is all very, very good. Most of this summer will be spent finishing Suite Scarlett, so expect lots of posts about writing again. The other very exciting piece of news that just happened is that I will be collaborating on a holiday book with John Green and the amazing Lauren Myracle. John and I have been talking about this a lot, but we couldn’t say anything until it was all a done deal. And now it is. It will be coming out for the holidays in ’08. I’m obviously thrilled to be working with someone like Lauren, and to get to work with my fake brother John. Last week, I promised to give away a book to whoever would make an internet fuss over Girl At Sea. A book is going out to first responder Katie Jarzombek, who dropped everything and went to her blog. Meanwhile, if you requested a Girl At Sea card and it hasn’t come yet, it should be appearing pretty much any second. I’m signing cards until the end of June (or until I run out of cards, or just fall over at my desk with a loud THUMP), so if you want one, write in and let me know! I'm a little broke right now, and I haven't had time to go to a bookstore, so I'm patiently waiting for my chance to win a book. I'm horrible with computer stuff, so I didn't even risk trying to "do something viral," 'cause I probably would have shorted out half the city (at best) or ended up advertising your novels as horrible (at worst). It wouldn't have been pretty. So, could you please do something for us peoples who aren't all technologically inclined? So I don't end up eating my own foot. Can't wait to read it, though. YOUR TIME HAS COME, JAS! Send me an address! You’re getting a book! See? You never know what’s going to happen! I have many cool things from BEA, including these special HARRY POTTER VII BAGS. Based on what Jas has written here, I am trying to think of an exciting way to give away these bags, and more Girl At Seas. Less technological people—ideas? I will attempt to write the MJ LIST OF THINGS TO BE AFRAID OF IN THE SUMMERTIME in the airport or the plane tomorrow. Also, as a followup to my previous post about my difficult relationship with shoes. Many of you were extremely disturbed by the fact that I don't like to shoe shop. Well, for all of you, today I bought TWO PAIR. Here they are, for your viewing pleasure. I love them both. This is enough of an accomplishment to merit a photo. Who knows? Next, maybe I'll cut my own food! Who can say? * Fear of Stuff On My List extremely sensible, though. I don't understand why people want to ban books. Do they think the books will give us "ideas" and we'll go out and kill a bunch of people? I'm not saying that COULDN'T happen, but doing everything in your power that nothing ever comes of it is pointless. Because what if the book actually inspired someone to--oh, I don't know, go out and be a doctor. Then that doctor decided to go to help third world countries and save lives? Or that particular doctor managed to find a cure for cancer? What if the book inspired someone to tell the truth about something to their friends instead of keeping it bottled up inside of them, letting it hurt them? What I'm saying is that you never know what can come of a book, and taking them away is taking away possibilities for great things to happen. Now that I've let go my little spiel, I hope that Free Monkey can go on another tour sometime. Not that there's much here to see (except a somewhat suggestive piece of modern art smack dab in the middle of campus). Also, I bought Girl at Sea on Friday, and I can't wait to read it! 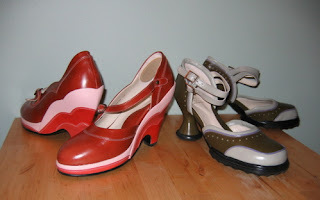 Ooooo, Fluevog! You'll have to let us know how they wear- they look comfy, but do they really last the whole day without killing your feet? Also, if you can't think of a super-fab thing to do with the HP bags, I'll be glad to take one off your hands. I'm currently planning a huge HP party in August for the end of the series and am looking for giveaways (since my big ol' pregnant belly couldn't be hauled to BEA or ALA this year). oooOOOooo pretty shoes. (and i don't even like shoes. unless they're shiny or colorful or otherwise make me like them because of my add-ness. )and the link for little willow didn't work for me. did it work for anyone else? So between Scott Westerfeld's blog and your blog, I seriously feel I am missing out on this whole BEA. I mean can anyone go? Because if they're handing out Advanced Readers Copies (first three chapters of Extras!!!!) or Harry Potter VII bags, and there are authors everywhere...I mean, it's like a slice of heaven on earth. And boo to banning books. Ugh i have to wait like a month before i can read Girl at Sea since i have to wait for my next 3 monthly order from Amazon. Time is slowing down on my behalf! O n YaY bout the new book........ n the shoes..............n bout not givin up on the bannin book thing!! whooooo!!! i'm still sad about the ninja librarian having to give up her job. keep us posted. the shoes are sublime though. I love those red shoes! They are almost as cool as a pink Vespa. I really hope I win a Girl at Sea. (Why are the Canadian cover prices so expensive? Why?) I am one of those technologically challenged people, so hopefully someone will come up with a really good idea. I too am mystified by book banners. Everything always gets more popular once it's scandalous and forbidden. Haven't they noticed that? Still reeling from the Ninja Librarian resignation. People throughout history have given up jobs (also lives) over ideals. We need to make sure that Ninja Librarian Susan did not resign in vain. We need to keep reading-- and not just "safe", mind-numbing pap (unless that's just what we're looking for, of course!). We gotta read what we want to read. Read what's right for us at the moment. You're a tough cookie, Susan. I applaud you and the ideals you uphold. Many libraries would appreciate your tenacity. I'm sure many at the school already do. is there going to be a movie for the key to the golden firebird?!?!?! http://www.imdb.com/title/tt0795411/ i want one for 13 little blue envelopes and devilish... and girl at sea now that i think of it and... okay all of them. I have this warm, fuzzy feeling inside right now, and I'm not sure how explain it except to say that Maureen, you are so cool! I didn't know speaking your mind could get you so far in life. I don't know what else to do, unless someone's got some connections with a big new network... anyone? Maybe a full-scale investigation by those, ahem, "in-depth" reporters will get their attention. We have freedom of speech, we should darn well make use of it! I just looked up all the books you mentioned the book-banning people were banning on Amazon (those that I haven't already read). I am SHAKING MY HEAD at their stupidity. Why do people ban books? If you think YOUR child is not mature enough to read it, say "You shouldn't read that, honey." But no, because that would involve actually (gasp!) TALKING to your child about what they are reading, and it is so much easier to get the spineless, mentally retarded principal of your kid's schools to take it away from library bookshelves. I have heard of an account in which some girl got so into a book she thought it happened to her and told everybody her brother raped her. But that girl must have been insane already. Who do you know that would actually go on a killing spree or whatever because some bad, bad book gave him the idea? I've probably offended someone by now, and this is a really really long comment. It's just that I hate book banning. Only two things make me madder: Dave Pelzer and Jay's Journal by Beatrice Sparks. I wish I had a fake brother. What's the holiday book about?? Can't wait...anything written by you and John Green goes automatically to the top of my list! Also, why did you leave your other publisher to go to Scholastic? Was it because of the headless girls, or something more than that? Just so you know-- and not that it makes things any less awful-- Susan has not been a librarian for 33 years. No doubt she has worked for the Mid-High for 33 years and has been their school librarian for I'm not sure how long, but this is not the super-shocker "i can't believe someone in a position longer than i've been alive had to resign NOW" thing that it sounds like. It IS awful. And she has fought the good fight. But I thought y'all should have this in some kind of context. I went to the PABBIS website to see what they were all about and my mouth is still hanging open. In their "What To Do" section, I find it ASTOUNDING at how little time they devote to PARENTING your child versus how much they've written on making it the school district's responsibility for keeping "bad books" out of your children's hands. While they claim it is up to the individual parent to decide what is "bad", keeping a list on the site suggests otherwise. They can sugar-coat it however they like, but they're still appointing themselves gatekeepers of what is and isn't appropriate. And as a parent, I resent other parents taking away MY right to choose what MY child can read at school. Holy crap book lady resigned???!!! Hmmm... maybe she got a better job somewhere else. Did you see Girl At Sea is featured on the YA column of Bookslut? Your monkey reads banned books. He's knee-deep in The Bermudez Triangle. Wait. He doesn't have knees. Nevertheless . . .
New book? Awesome! I will have something to look forward to in May. And hurray for a girl with a head! Ack, those shoes are awesome. If they happen to vanish, please rest assured that they haven't actually suddenly become invisible, I just stole them. Oh, by the way, I have a good (well, that is up for debate) idea about a sort of contest-maybe for those not skilled with a computer or not able to access one readily upon free-book announcements. They have to know someone who knows how to work at least one of those cheap disposable cameras though. Or be descriptive writers! So take a picture of or write about how you make use of a book (in a sense, saying why they deserve a copy of Girl at Sea). What uses do books have, those besides reading and causing big hubbubs in Bartlesville? Please, let there be no fire involved. But maybe you use them as weapons against flying monkeys! (Though this is in no way encouraged, of course.) Or perhaps they serve you in a different way, as stacking them up to make a soapbox in the middle of a sidewalk, or using one as a guide to treasure. Takes a lot of thinking and creativity, and yep. They could write about it in an expository format or prose? Or just snap a picture of them. And I had another idea (today is my idea day, I have one every other week). Perhaps, for all of us crafters our there, make something that sort of has to deal with Girl at Sea or A girl at sea or Italy or other things. Can be anything, a painting, prose, perler beads, photography, duct tape, yarn, stuffed animals, claymation, the souls of many, etc. For instance, I crochet. I have no idea how I would make something pertaining to Girl at Sea...but I could try. Mmhmm. That's my two cents. Or four, now that I've commented twice. YAY!! I'm very excited that a) you're working on another book!!! b) that you'll be working with John Green! Seriously, whenever some of my favorite authors get together to write something that I know will be amazing...I can do nothing but jump for joy. :-) I also can't wait to read about Free Monkey's experience soon, and once I finish The Key to the Golden Firebird tonight (AMAZING, by the way...) I'll have read everything I could by Maureen Johnson. Love the shoes. How do you find such interesting shoes? Within the next three years, I'm hoping to be an English teacher, and your situation reminds me of something that was discussed this weekend with a friend of mine. We were figuring out "covert ops" ways to recommend books that some of those crackpots might see as inappropriate. It's a sad state of affairs when education has to stoop to espionage to give a student something they can be interested in. and if you do decide to cut your own food, make sure you have band-aids, in case of an incident. i'm reading the key to the golden firebird right now. I checked it out of the library because I can never find it anywhere. is by any chance out of print or is it just never in stock? is it true that it's going to be made into a movie? i put the link to the imdb page on it up a few comments. yes the link to my website finally works! Soooo, I don't know if anyone else noticed it, but that Middle Schools Association thing is having a conference in Washington DC at the end of June. Are any loudmouth teen librarians going to be at ALA a few days early and can try to track down Ms Vernon? g including Ed Hardy Men's Clothing,ed hardy clothing Clothing,Ed Hardy Kids Clothing, ed hardy womens Sunglasses, Ed Hardy Swimwear and more. chaussures pumaquelle paire de chaussures pour hommes choisir?!? La réponse est toute simple:chaussures nike une paire de baskets en partie vernies. du 17ème au 5ème rang, qui lui offre une place dans un top 5 largement tn requindominé par les sites de vente de produits high-tech. Le site de réservation d'hôtels Bookings.com gagne pour sa part 47 places et atteint le 8ème rang. There are cheap columbia jackets 10 pcs of excellent Ralph Lauren multi-colored stripe big pony spyder jackets. These products are more soft and comfortable for being made of breathable and durable mesh cotton . lacoste sweaterthere are lots of colors and sizes for your choice, just pick up one you like ,it is absolutely value for money. PayPal Payment. Enjoy your shopping experience on mensclothingstore.Usnike max shoes, one of the world's three major brands of Puma shoes, will build its factory in Lanshan county next year, Hunan province. Taiwan Diamond Group of Footwear production chooses its base in Lanshan county, which is one of top 500 companies in the world.